Capture the magic of the season with our traditional poinsettia basket filled with three plants to fill someone’s Christmas with enchanting winter spirit. Poinsettia is the traditional flower of Christmas and with its expressive red and green leaves it an ideal gift to warm someone’s heart at this time of year. 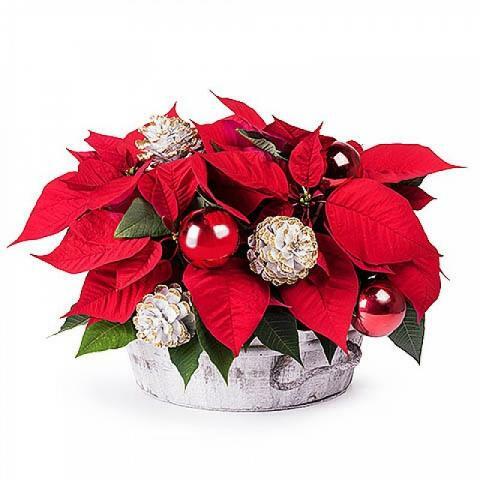 Add extra sparkles to your loved one’s holiday decorations and share a smile from far away with this bright red Christmas flower. Order was handled exceptionally well. Amazing Service and products !! Highly recommended. Have now used FloraQueen 4 or 5 times... never a problem..! The recipient was most satisfied with the gift.